Biltong, a form of dried and cured meat that originated in Southern Africa. Yes, that’s right, biltong in it’s truest form belongs to us and we really love our biltong. In fact, we love biltong so much that one South African, Maxine ‘Dr Biltong’ Jones, received her doctorate degree in food science from Stellenbosch University with her PhD research focused on the science of making consistently great biltong and South African expats miss biltong so much that you will now find many South African shops in London and the UK that sell foods such as Ouma Rusks, koeksisters and of course biltong. If that is not enough to convince you of the South African love of biltong, we even have the annual Biltongfees event taking place in our own backyard in Dundee, KZN. Now that we all agree that we really do love our biltong, we have taken the liberty of searching wide and far on your behalf for the very best biltong recipes that you can make on rugby game days, family events or as a treat for your colleagues at work. Preheat the oven to 180˚C and coat the bread pan with butter. Mix the self-rising flour, soup powder, buttermilk and biltong well and evenly. Spoon into the pan and flatten the top. Spread the cheese and red pepper over the top. Toss the biltong, rocket, avo, feta cheese, tomatoes and olives together. Salt to taste and add a salad dressing of your choice. Melt the butter in a pot and add the mushrooms, black pepper and cook for 5 minutes on between 180 and 200 degrees. Add the flour and mix well. While mixing add the milk and stock and stir continuously. After mixing well, allow it to simmer slightly and then add cheese. Reduce the heat and continue mixing and stirring until the cheese is melted. Add cream and stir continuously. 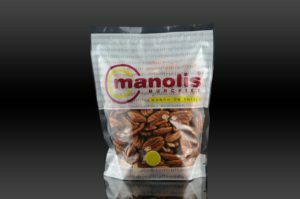 Before serving, add the Manolis Munchies biltong on the top for garnish and enjoy your amazing soup. 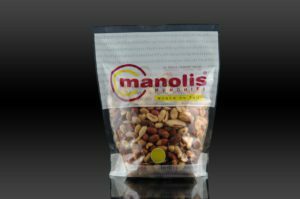 We do not only have biltong but also a wide variety of healthy nuts on offer. 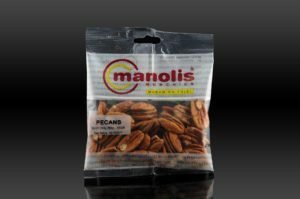 Our nuts range from Almond to Cashew, Brazilian to Macadamia, Pecan to Walnut as well as a mixed nuts offering with either peanuts or raisins. 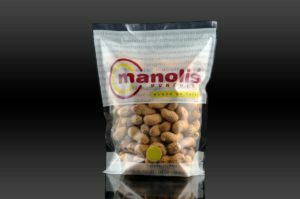 One thing’s for sure, Manolis Munchies has an offering of healthy nuts to suit every taste bud. The high fibre value means that, among the many benefits, they assist in achieving a healthy weight, lower cholesterol levels and help to keep your colon clean and healthy. This powerful substance helps prevent or stops cell damage caused by oxidants. They contain healthy calories, protein, carbs, fibre, Vitamin E, Copper and many more nutrients our bodies need and crave.